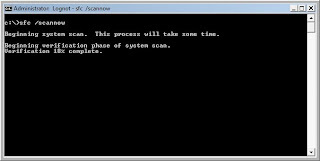 Inside Windows OS there is one built in command-line tool called 'SFC' to check and repair all protected system files. SFC scans the integrity of all protected system files and replaces incorrect version. Example on command prompt type "c:\>sfc /scannow" to verify and repair all protected systemfiles . /SCANNOW - Scans integrity of all protected system files and repairs files with problems when possible. /VERIFYONLY - Scans integrity of all protected system files. No repair operation is performed. /VERIFYFILE - Verifies the integrity of the file with full path . No repair operation is performed. Why does our SFC cmd help-screen claim there is NO "verify only" options at all?? ?